Everyone loves to complain about Seattle’s public transit, myself included [mb]. And what better way to complain than a regional rivalry? And so, Seattle’s friendly little Metro buses are always getting picked on by Portland’s Trimet system, shiny with its cute Venn-diagram-esque logo and MAX light rail. But this week I asked myself, is transit that much better for our little cousin to the south? I first experienced Trimet as I stumbled off the Amtrak from Seattle last Wednesday (awesome train ride, by the way), directions from Portland’s neat and efficient trip planner carefully copied into my notebook. The first thing I noticed? Free. Unlike Metro’s downtown peak hours Ride Free Zone, Trimet’s Fareless Square [#] extends 24 hours and covers a generous swatch of downtown and adjacent areas. The “square” even juts out across the river to run over to the convention center and shopping area, charmingly destroying any actually squareness of the map. With the timeframe and coverage, Trimet displays a commitment to pragmatism as well as encouraging people to use transit in every sphere of life. Seattle could take a lesson here. But always one to look a gift horse in the mouth, I have to complain about the route maps. Route maps are always a challenge: there’s just no room for detail, so how can you communicate context and major landmarks? Seattle’s maps will throw me off sometimes (especially combined ones or expresses, like that awful 70/71/72/73 schedule), but generally you have some idea where in the world you are. By the time I found the schedules on my first bus (tucked up against the ceiling in the middle of the bus, what?) and figured out the jumble of cross-streets and unmarked timepoints, I had already ended up at the route terminal–the wrong one. Shape up, Portland. But Portland feels more, well, committed to riders than Seattle. 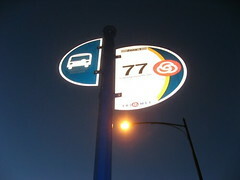 Many bus shelters include LED signs displaying the next bus arrival time, a handy bonus that Seattle has yet to expand beyond a couple of stops on Aurora. The website is intuitive, informative, and well-designed. Schedules and signs list the ways to contact Trimet, including a 24/7 customer service line. One gets the feeling that Portland wants you to ride, whereas Seattle just want to get you the hell off 520. And of course, there is the hallowed light rail system, envy of transit fans everywhere. I’ll save my thoughts on the MAX for another time.